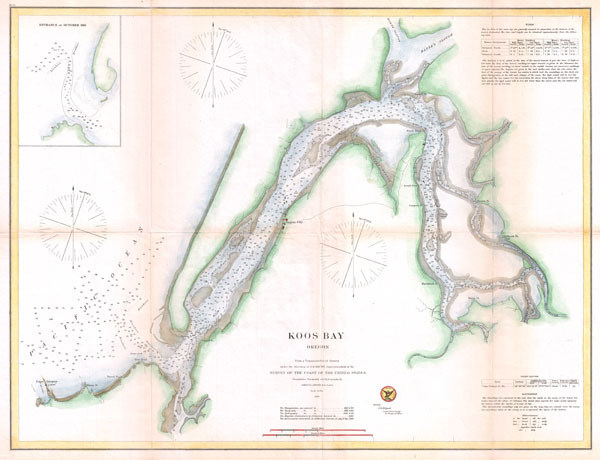 A very nice example of the U.S. Coast Survey's 1865 map or chart of Coos Bay (Koos Bay), Oregon. Details the' S' shaped inlet as far as the Coos River. Identifies Empire City, Marshfield Point, and other destinations. Marshfield was later renamed Coos Bay and has become one of the largest commercial shipping ports in Oregon. This chart offers detail navigational information throughout, identifying shoals, bends, inlets buoys, and breakers. Countless depth soundings throughout. The upper right hand quadrant had a text block offer notes on tides. A similar block in the lower right corner details Light Houses and Sounding. The Topography and Hydrography for this chart was completed by James S. Lawson under the supervision of A.D. Bache, Director of the Coast Survey.